I've just finished working on a new layout for Tau battle reports. Now can you browse the Warhammer Tau blog for battle reports against each army type under the BATTLES tab on the sidebar. So if you click on the link for Space Marines VS Tau, you'll get all of the Tau battle reports against all the different varieties of Space Marine. If you click on the Tyranids VS Tau link, you'll see all the Tau battle reports against the Tyranid swarms. It's only a small thing, but I'm really pleased I've managed to tweak the way that Blogspot displays labels to make it work. Please bear with me while I go through and map all the battle reports to each relevant section. In the meantime, stay tuned for new Tau battle reports! I have no idea how to contact you other than through this. I just wanted to let you know that A ways away in the Seattle Washington area there are two Tau players (one being myself) that are still showing that the Tau are not as broken as most people believe. We have been posting high rankings for the Greater Good in several tournaments including sanctioned GW GT tourneys. 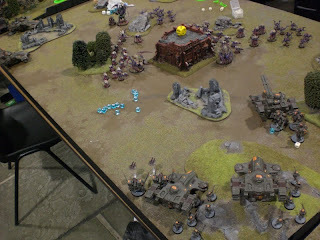 Just last Saturday, the 25th, I myself placed 4th out of 47 with my tau at a GT tourney. Looking down the list, It did turn some heads that a Xeno (that was not Necron) was as high up as it was. Just thought you would like to know that there are others fighting to keep to the Tau known.